Do not be daunted when you see the words home made chocolate. It really is easy to do. A while back I needed a lot of chocolate to make a recipe and for some strange reason, none of the shops that I went to had any sugar free dark chocolate in stock. When we were at the opening of the Pick N Pay at the V&A Waterfront, my friend Bernice who blogs at Betty Bake asked me why I did not make my own. This had never entered into my thought pattern but now that the suggestion was made I spent some time thinking about doing this. I have so much Willie’s pure cacao at home (which can now be bought at the new Pick N Pay by the way), as I bought about 15 of them when they were last on special. I also have some cacao butter which I received when I went to a rawlicious evening. That and honey were all the ingredients I needed to make my own chocolate. This chocolate can be used for baking as is, or it can be tempered to make chocolate treats. I decided to eat it as is, and place it onto some lovely chocolate transfer sheets to decorate it. 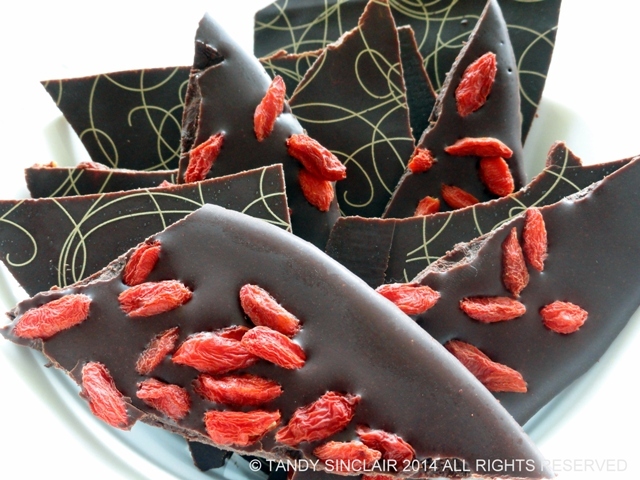 I also tossed in some goji berries to make it look pretty and up the health factor! I bought myself some pure cocoa before Christmas and I’ve yet to play with it…… you make it all seem easy to do. I don’t have cocoa butter though, what would you advise? Oh Wow Tandy–this looks and sounds amazing-i will have to give it a try. I am sure it will go down well–as the whole family have embarked on a no sugar diet. This is awesome! … and so gorgeous to make for Valentines Day! You are so clever, I have to try it for myself! Hope you enjoy the process, and the eating! I never made my own chocolate…thanks for the recipe Tandy…I will have to try this one of this days. Of course, what a genius idea Tandy! Thank you! My trainer told me how to make my own chocolate and it was so satisfying. Very impressive – I really want to try this. Need to track down the ingredients! A good health shop should have them! Well done Tandy on making your own chocolate.